Father’s Day is an amazing collection of contradicting clichés, when you get right down to it. I mean, how many dads actually enjoy wearing a tie? And who wants to be the one bogged down with grilling dinner on your holiday? Now, let’s have an imaginary show of hands if you’ve enjoyed an iconic Father’s Day with your dad by attending a ball game, or going fishing, or cooking on the grill, or playing golf, or walking the beach, or visiting an amusement park. Certainly, there are many imaginary hands in the air. Now, how many hands would still be in the air when asked if you celebrated the holiday flying in a formation with your Dad? Most hands are probably down at this point. Here are two pilots who would still have their hands in the air. In the accompanying T-34 three-ship photo, there are two pilots flying with their dad. They did it on Father’s Day. Leading the formation is Ryan Hunt. Ryan can raise his hand because that’s his dad, Paul Hunt, flying #2 on his wing with Paul’s uncle, Randy Hunt, in the pit. Paul can raise his hand because that’s his dad (Randy’s brother), Jimmie Hunt, flying as #3 on their wing. So you see, Ryan is leading his dad, great-uncle and his grandfather in a Father’s Day 3-ship! But there’s a lot more to this story. The whole flight was actually just a happenstance when Paul and Ryan decided to join Jimmie and “Uncle Randy” for a Father’s Day visit last summer. For this family of pilots, being together around airplanes is nothing unusual—they are all active pilots and they are together often. On this particular Father’s Day visit, the weather was nice and, as Ryan says, “The planes were just sitting there when someone says, what the heck, let’s go flying.” Obviously, they did just that. To say aviation is a big part of the Hunt family is really an understatement. Beginning with Jimmie Hunt, the flying picture originates when he was a young man and continues to this day—62 years later. While working for a J-3 Cub crop-duster in southern Georgia, Jimmie eventually got a ride. Jimmie was hooked. Saving every penny he could, Jimmie eventually had enough money to buy his own plane—a Luscombe. Jimmie logged many hours in that Luscombe. But soon, service to our country stood in the door and Jimmie put his flying on hold. After a ‘hitch’ in the Army, Jimmie came home to Fort Gains, Georgia, got a job as a heavy equipment operator, and he and his wife Leen began raising a family. Jimmie knew flying itch was still there. With the help of the G.I. Bill, he continued flight training and soon realized it was more than an itch—he wanted to pursue an aviation career. Jimmie bravely left his heavy equipment operator job for his first flight-for-pay job flying Super Cubs for the Georgia Forestry Service. Committed on this path, Jimmie ultimately left Forestry Service flying when a Georgia trucking company offered him a job flying twin-engine Beechcrafts. After a couple of years with the trucking company, he sent his application to a local service air carrier called Southern Airways. Hired by Southern as a DC-3 co-pilot, Jimmie flew through all the mergers and ended a very successful aviation career, retiring as a B-747 Captain for Northwest Airlines. After owning over eighty airplanes over the years, including 8 or 9 T-34s, Jet Provosts and even a couple of P-51 Mustangs, Jimmie narrowed down his favorites. Today you’ll find Jimmie Hunt enjoying his T-34, a C-185 and a PA-11. Jimmie’s son Paul picked up his interest in aviation early—around age 7. Actually, it was probably sooner than that. As Paul says, “It was hard not to get into aviation as a kid when Dad always had airplanes in the barn, sometimes as many as 5 at a time. I always figured out some way to get the keys to all those planes.” Paul earned his pilot certificate when he was 16 years old. Before he was 20 years old, Paul had time in Barons, a Travel Air, an L-19, several C-172s and C-180s, a C-195, a few T-34s, T-6s, a Stearman, and a Citabria just to name a few. Yes, he even flew a Mustang as a teenager. With so many airplanes in his backyard and always helping his A&P certificated dad work on them, it was only natural that Paul earned his A&P certificate as well. Paul sorely wanted to become an airline pilot. However, airline pilot hiring was down at the time, so he decided to pursue an aviation maintenance career. Paul hired on as a mechanic for the same company his dad was flying for—Republic Airlines. By this time, his dad Jimmie was flying DC-9s for Republic out of Memphis. In fact, Paul once flew with his dad as the mechanic on a Republic flight out of Alaska. Paul continued pursuit of his pilot ratings while working as a mechanic through the Northwest merger. Eventually, Republic started laying off both mechanics and pilots, so Paul took a company layoff and hired on with a night-freighter company flying DC-3s…at 12 cents per mile! It’s no surprise to learn he could not turn down a job offer that not only had him going back home to Atlanta, but getting to fly Falcon jets. However, not long after becoming a charter pilot, Republic became Northwest and started calling back mechanics. Paul decided to return to his job as a mechanic in hopes that he might have a chance at a pilot slot with the company. It worked! Paul is now an MD-88 Captain with Delta Airlines. Paul’s son Ryan didn’t have much of a chance to avoid aviation either. He was around airplanes from his days in diapers and has been ever since. His first flight was in his grandmother’s Citabria, at the tender young age of four…weeks. By four years old, Ryan was riding pedal planes around the hangar. He’s pretty much been flying with his dad and grandparents ever since. Ryan started his dedicated flight training in a C-172, soloed when he was 17 years old and now holds his commercial SE and ME instrument ratings. Ryan is currently working on his college degree and has been working as an A&P apprentice for about three years. Yes, like his dad and granddad, Ryan also decided to pursue an A&P certificate. He earned his A&P certificate this May. 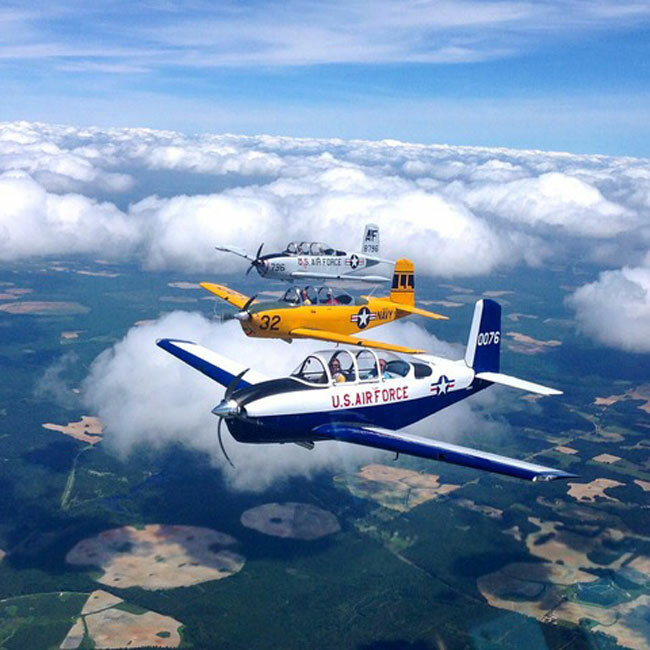 When he’s not in school or at work, you can find Ryan enjoying the family J-3, T-34 or Baron. Then there’s Randy Hunt. Back in the early 1980s, Jimmie noticed his brother Randy paying a little more attention to the family flying. Seeing this interest, Jimmie started encouraging Randy to get some training. I guess you could say he took to it pretty good. Randy jumped in with both feet, loved it, and now has his single and multi-engine ratings. That’s a good thing since he owns and routinely flies his Beech Debonair, T-34, J-3 and PA-18! There’s another Hunt who could have been flying in this 3-ship—Jimmie’s daughter Chrystal (Hunt) Freeman. Somewhat of a late bloomer in aviation, Chrystal decided she wanted to become a pilot in her late twenties. Chrystal started her flying in a Citabria and later earned her pilot certificate in a Cessna 150. You think she stopped with her basic pilot certificate? Of course not. She’s a Hunt. Chrystal is now a corporate pilot flying King Air350s. Were this picture taken on another Sunday holiday, this could have been a Mother’s Day special. That’s Leen Hunt in the back seat of #3. Yes, she’s another Hunt pilot! Leen learned to fly back in the 1970s when her boys were teenagers. Later, Leen and Paul were actually getting their pilot certificates at the same time. She checked out in the T-34 years ago when they lived on an airpark south of Atlanta. Leen also holds a commercial SE and ME instrument pilot ratings. Maybe someday there will be a Hunt 6-ship to write about. Wouldn’t that make a great Mother’s Day event?